We have stock currently on demo in our store. 12 available for next working day delivery. The Yamaha HS5 monitors offer an exceptionally flat response in a compact enclosure. When choosing reference monitors for mixing and music production, accuracy is the prime consideration. Speakers that sound &apos;good&apos; on first impression may not necessarily be accurate. What you really need is an honest reference for your mix, rather than monitors that have been tweaked or coloured to deceptively sound impressive. The HS5 reference monitors have been created by Yamaha&apos;s studio monitor engineering team to deliver exceptionally flat, accurate response that you can trust. Unlike &apos;monitor&apos; speakers with exaggerated bass and treble that make a good first impression but can&apos;t be relied on for accuracy, the HS series were designed to be true studio reference monitors in the tradition of the legendary Yamaha NS10M. Whether you&apos;re mixing for stereo or 5.1 surround, mixes that sound good on Yamaha HS5 reference monitors will translate accurately to the widest possible range of reproduction systems which is engineer-speak that simply means they&apos;ll sound good on anything. And that is the ultimate goal of any reference monitor. The elegant white-cone speakers used in the HS5 monitors deliver superlative audio performance that is further enhanced by a carefully engineered mounting system. A system of screws and a specially designed mounting ring eliminates spurious vibration and resonance, allowing the speaker to deliver its full sonic potential. Another feature that boosts woofer performance is a magnet selected to produce accurate, solid low-end response. The tweeter frames employ an advanced smooth-contour design that minimises losses so that high-frequency details come through with remarkable accuracy. The extra thickness of the tweeter frame also minimises resonance that can interfere with high-end clarity. The overall result is extraordinarily smooth, accurate response throughout the audio spectrum. Powered, bi-amplified monitor speakers simply make the most electrical and sonic sense, and that&apos;s why they have become the first choice of sound professionals the world over for near- and mid-field monitoring applications. In addition to the obvious advantage that you don&apos;t need separate power amplifiers, the fact that power and speakers are integrated in one unit means that the amplifiers can be perfectly matched to the characteristics of the speaker units used so you get consistently superior performance with any source in just about any listening environment. Bi-amplification means that separate power amplifiers are used to drive the low-mid and high-frequency speaker units, and this eliminates interaction between the units as well as the response and phase anomalies introduced by passive crossover networks. Both speaker units can function at optimum performance levels for correspondingly high overall sonic quality. One feature of the HS5 monitors that you&apos;ll hear but are not likely to see is the extra large magnets. In combination with an advanced magnetic circuit design these magnets provide a powerful, uniform, tightly controlled flux field that results in exceptionally smooth response and dynamic capability over a wider frequency range. All you really need for top-class stereo production capability is a good audio workstation and a pair of HS5 monitors. 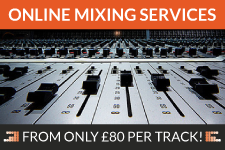 A system like this is not only portable and extremely easy to set up anywhere you need it, it can deliver outstanding monitoring performance that will let you get your mixes just right. The response-control features of these monitors let you tweak them for the best response no matter where you set them up. Although stereo is still the most common format for basic music listening, 5.1 surround has become the audio format of choice for today&apos;s advanced visual media, and is beginning to be recognised as a superior vehicle for pure musical enjoyment as well. But to properly mix and produce surround sound you need a good 5.1 monitoring system. The HS5 speakers and subwoofer are the perfect choice if you want competitive surround-monitoring performance without having to spend big-studio megabucks to get it. Speaker response can vary greatly depending on the size, shape, and surface acoustics of the room in which they&apos;re used, as well as how they&apos;re placed within that environment. The HS5&apos;s give you room-matching and speaker placement versatility with ROOM CONTROL and HIGH TRIM response control switches that are specifically designed to compensate for common acoustic deficiencies and monitoring needs. The ROOM CONTROL switch, for example, can be used to compensate for the unnatural low-end exaggeration that usually occurs when speakers are placed close to walls or in corners. The HIGH TRIM switch offers the same type of response-tailoring capability for the high frequencies. Weight: 5.3 Kgs / 11.7 lbs.